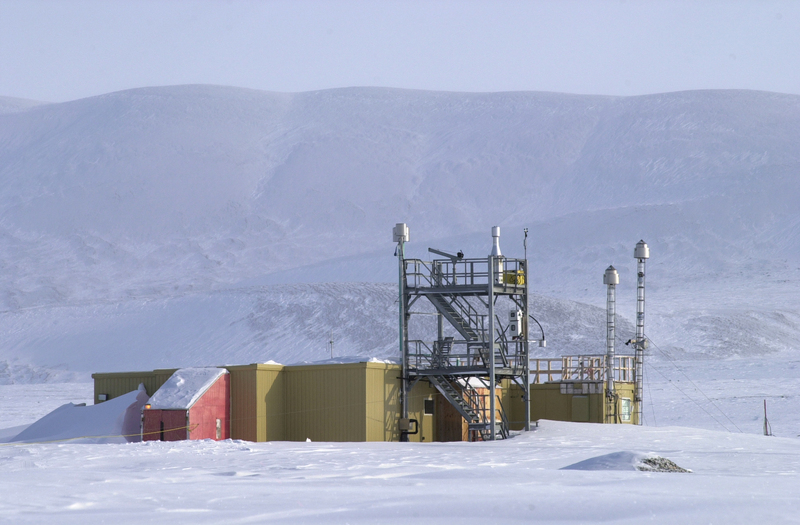 The Alert Research Laboratory is the site of a range of activities by the Atmospheric Science and Technology Directorate (ASTD) at Environment Canada, including stratospheric ozone and UV measurements, ground-level ozone measurements, Greenhouse Gases, various isotope studies, optical and chemical properties of aerosols. Monitoring of Persistent Organic Pollutants and mercury measurements, air monitoring and surveillance of chemicals and shorebird populations are also conducted at this site. Weekly flask samples for CO2 measurements have been collected in Alert since 1975. The Global Atmosphere Watch (GAW) Observatory was permanently established in Alert in 1986, with an addition to the building in 1992. Today, the observatory is administered by ASTD and research and monitoring programs have been established with more than a dozen distinct research groups – including other Government of Canada departments and international academic and government researchers. Stratospheric ozone; Ultra-violet radiation; Ground-level ozone; Greenhouse Gases; Isotopes; Properties of aerosols; Persistent Organic Pollutants; Mercury measurements; Air monitoring & surveillance of chemicals; Radionuclide monitoring, etc. ASTD currently owns 4 vehicles on-site (4×4 pick-up trucks): two are equipped with a track system for winter use and two are for summer use.